Thanks to smartphone and laptop: approx. one third of the employees also work in their leisure time. More men than women, more civil servants than private employees, more executives than supporting staff also work during leisure time again and again. Either because they have to, or because they are unable or unwilling to get away from it all. 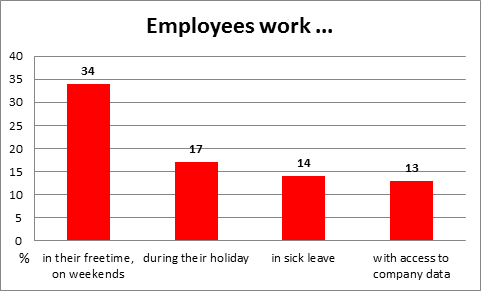 People work even while they are on holiday and sick leave - that's what 17 and 14 percent, respectively, of the respondents say. 25 percent have also worked during a nursing leave. However, only nine percent of the employees in Austria have made use of a nursing leave in the past three years. 17 percent don't have private mobiles any more and many employees use their work mobiles for private purposes. This is indicative of the fact that many employees don't keep work and leisure apart any more. 11 percent have work laptops. As a result, already 36 percent work with their mobiles or laptops beyond normal working hours. For every seventh person (14 percent) this is the order of the day. For many employees this is even in their own interest, others wouldn't get their work done otherwise. Frequently, superiors expect people to do extra work. Those 13 percent of employees who can work at home or on the road while having access to the computer networks of their companies are a special group. In this case we may proceed on the assumption that they have special working time arrangements. For holidays, "all inclusive" may be a good deal; in an employment contract it is a nuisance. 18 percent of the respondents report that they have all-in contracts. However, more than half of them say that the number of (extra) hours is stipulated. More often than not employees with such contracts have to work more extra hours than agreed. Frequently, these extra hours are neither paid nor compensated by time off. However, it makes sense to keep constant records of working hours. Long working hours make job and private life less compatible. While 83 percent of the employees without all-in contracts find it easy to reconcile their families and jobs, this is true for only 74 percent of those with all-in contracts. Always there for the company? The subject of blurring of the boundaries of labour is becoming more and more topical. It means the interruption of leisure by job tasks, first by reading and answering e-mails at home or at the holiday resort, then by work phone calls - and last but not least by major jobs done in one's leisure time. In the majority of cases, these working hours are neither paid nor compensated by time off. 18 percent of the respondents in the Work Climate Index say that they have all-in contracts. All-in employment contracts are mainly derogatory to the employees: in addition to fixed base salaries the enterprises usually pay lump-sum overtime surcharges - but some of them don't. Frequently, employees work a lot more extra hours than are covered by this lump sum. The Chamber of Labour appreciates that the government is planning to stipulate that such contracts have to be more transparent, e.g. by clearly quoting the base salary. When a company honours employees for "long-standing loyalty", speakers often make believe that employees alone are responsible for the long period of employment. In fact, however, it's up to the enterprises themselves to make employees happy to stay in the company for a long time. In the group of employees older than 55 years of age the average period of employment is 19 years. But there are some exceptions: almost every tenth person over age 55 joined his/her company no more than two years ago. Younger employees change their jobs more often than older ones: 30 percent of those 26 to 30 years old have already had four employers or more. The average period of employment in this age group is only four years. Temporary work contracts, minor employments and precarious employments lead to more frequent job changes, especially among young people. As a consequence, only 12 percent of those between 26 and 30 years old have had only one employer so far. From this it becomes apparent that only companies offering good working conditions are able to motivate young employees in the long run and make them stay for longer periods. Employees in the public service and bank clerks are continuously employed for the longest period on average. 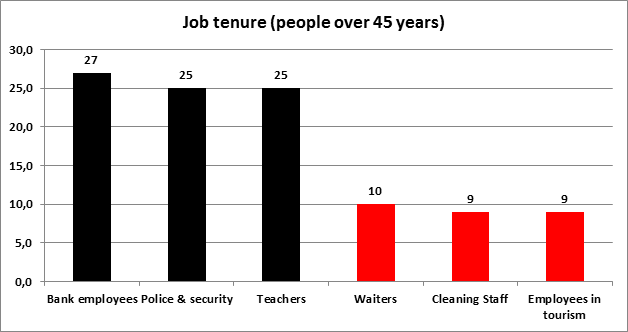 Older employees over age 45 in public security, teachers and other public employees have been working for 25 years, on average, for public authorities, bank clerks even for 27 years. Probably, this result is mainly attributable to a high job security and the usually good working conditions. Bad working conditions cause frequent job changes. Austrian employees like to stay in their companies - provided that the conditions are all right. For example, older employees in the catering trade, cleaning personnel, building workers, and employees in geriatric care stay at the same companies for ten years on average. In this context, working conditions, which are often bad in these sectors, play an important role. In the period considered, i.e. 2008 to 2013, every tenth employee, on average, wanted to change the company - but every seventh waiter/waitress and almost every fifth building worker. The assessment of one's own chances on the labour market strongly influences people's readiness to change. Where these chances are regarded as good the will to change is substantially more pronounced. Younger people feel more positive about their chances on the labour market; therefore they change the companies more often. Older people, however, have often given up: only 29 percent of those older than 45 years of age believe that they have good chances on the labour market. Education helps: only 23 percent of the older employees with only minimum compulsory schooling, but 40 percent of those having a university degree still believe in their good chances on the labour market. If stress is high, e.g. because of pressure of time or missing social integration, people plan to change the company more often. If enterprises want to keep their employees in the company for longer periods they should pay attention to their employees' general satisfaction with professional activities, satisfaction with income and with company benefits. Economic and socio-political discussions are accompanied by a cornucopia of figures and data, many of which are aimed at facilitating welfare cuts and curtailing distributive justice. The Austrian Work Climate Index, however, is a benchmark for economic and social change as seen by employees. It examines their assessments with respect to society, company, work and expectations. Unlike the standard key indicators of economic development, the Work Climate Index captures the subjective dimension, expanding our knowledge about economic developments and their implications for society. The Work Climate Index is calculated based on quarterly surveys among employees in Austria. The random sample of approx. 4,000 respondents each year is selected with a view to being representative so as to enable telling conclusions regarding the feelings and the wellbeing of all employees. Since the spring of 1997, the Work Climate Index has been calculated twice a year. There are also supplementary special evaluations. For current results and background information, please visit www.arbeitsklima.at. There, you will find the comprehensive work climate database for evaluations. In addition, you can also calculate your personal job satisfaction index online within just a few minutes. Another online service is our Managers' Monitor. It provides answers to questions about the current job satisfaction level among Austria's managers. Acording to the Public Employment Service almost 370,000 people were unemployed at the beginning of 2014, and some 80,000 attended training measures. Unemployed people have to cope with big financial problems. 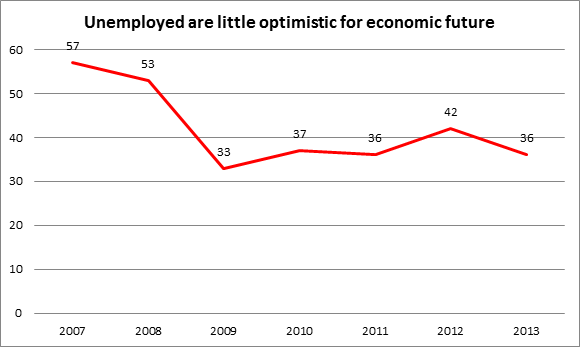 Pessimism regarding the economic future of the country has risen sharply among the unemployed and is approximately where it was during the economic crisis of 2009. Almost two third have a pessimistic view of the country's future; among the working population things are the other way round (68 percent optimistic, 32 percent pessimistic). In parallel with the assessment of the economic future, the estimation regarding job security is becoming more pessimistic again. Only 16 percent of the unemployed think that jobs in Austria are secure. Among the respondents having a job 58 percent estimate that jobs are secure. Satisfaction with the income - or unemployment pay or social benefits in case of the unemployed - is only at 10 percent. Satisfaction with social protection is at 28 percent, life satisfaction at only 43 percent. Such a low life satisfaction is hardly found elsewhere in the data. Taking an average from all employees, 85 percent are satisfied with their lives. There are still some representatives from the business world or economic researchers who regard the unemployment pay or even social benefits as "too high". Some think that the amount of such benefits provides too little incentive for the unemployed to accept certain jobs in the low-pay sector. According to the Work Climate Index only 52 percent of the unemployed say that they make do with the money provided by the Public Employment Service. For 48 percent this income is not enough to cover their costs. Currently, unemployed people receive a median income of 825 euros per month. Only 40 percent of the unemployed think that they will be able to live on their pensions later on. In other respects, too, apart from the financial difficulties, being unemployed doesn't mean to curl up in the "welfare hammock". Especially in case of longer unemployment psychological problems may arise and self-esteem will be adversely affected. Unemployed people are more often sick. A life satisfaction of only 43 percent in the Work Climate Index is alarming. A right to full time? Is part-time work for women really the big career decelerator that keeps them from earning higher salaries and retirement pensions? Yes it is, if they stay in such part-time jobs for many years. In most cases, child minding and geriatric care at home are the main reasons why people find themselves in part-time work. Many women are even happy to have such a job. However, in the long term, this form of work becomes a problem for women. For, it is primarily women who take care of children and elderly or ill relatives at home while their full-time employed colleagues continue to climb up the career ladder. By doing so, they rise up the pay scale, which, under the current system, will earn them higher retirement pensions later on. Many women want to work part time only temporarily. But in many cases, no full time positions are on offer, and then these women are stuck. In Germany, legislators want to make the right to full-time employment a law. This is a positive approach that could help many women escape the part-time trap.